Top quality roof stain remover for mold, moss, algae and mildew. After 25 minutes your roof will be cleaner! Fast cleaning roof stain remover for black streaks, roof algae, moss, roof mold and mildew. 6000 sq ft Roof Cleaner product, Use as directed, Safe around plants and pets. Roof Armor protection and Pro Applicator. The shingle roofs algae remover solution! You’ll just need a garden variety pressurized sprayer and jet spray on a garden hose. Every Roof Cleaner EZ-Pouch makes 4 gallons (750 sq ft) of powerful contractor strength roof shingle cleaner. 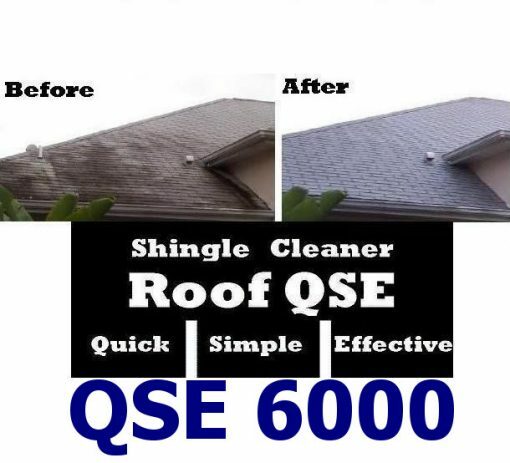 Roof Cleaner QSE 6000 contains 8 EZ Pouches making 32 gallons of roof cleaner. 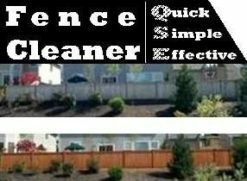 Roof Cleaning using Roof Cleaner QSE is meant for professional contractors or extreme do it yourself home owners needing quick results removing roof stains with heavy duty roof cleaner. Roof Cleaner OX products are better suited for a homeowner who is uncomfortable cleaning with a industrial strength roof cleaner. Roof cleaning with Roof Cleaner OX products is our most environmentally friendly roof cleaning solution. 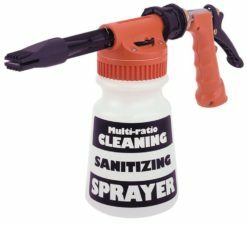 Why is roof cleaning with the EZ-pouch better? Each Roof Cleaner QSE EZ pouch is premeasured and ready to be added to 4 gallons of water. No Dish soap required, no liquid chemicals to measure. The number (Roof QSE ####) on our roof cleaner represents how much roof the cleaner will cover at FULL STRENGTH! Roof cleaning at 100% strength, no ranges, no guessing. How do I prevent future roof stains? Roof Mold ARMOR Protectant ensures that the roof cleaning you have completed will last! Roof Stain Armor spray can be applied to a clean roof, or a recently cleaned roof and prevents roof algae stains and roof mold stains from returning. There is no rinsing requirement with Roof Armor. Roof Cleaner Coverage table to determine which size product is right for your home.